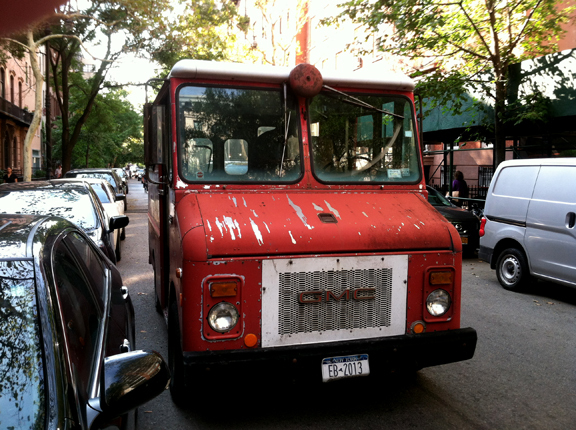 The more weather-beaten side of Mr. Del Re’s fire-engine-red truck. Dominic Del Re, a 58-year old former trader in cocoa futures, is one of the last mobile knife grinders in New York City. From 9 AM until 7 PM, six days per week, he slowly maneuvers his 15-foot fire-engine-red truck through the city streets. When the sound of his ringing bell is heard it is the signal to gather up your dull knives, scissors, lawn mower blades, ice skates and more. Bring them to Mr. Del Re’s truck in the street. As you wait he will put a clean, sharp edge on what you have brought. Once a man brought him two samurai swords! Without questioning the man Mr. Del Re refused to service them. He has a strict no-deadly-weapons policy. Notice the bell between the windows. Mr. Del Re rings it to alert potential customers. Mr. Del Re, who speaks with a rich, Italian-accented tenor voice, was born in the small, southern Italian town of Mola, which is on the Adriatic Coast. He moved to Bensonhurst at the age of 15; and graduated from Long Island University at 23. He and his wife Antoinette raised two sons on Staten Island. The better side of Mr. Del Re’s fire-engine-red truck. Dominic Del Re sharpens one of our scissors. Knife sharpening runs in the family, at least his wife’s family. Her grandfather, her father Giacomo, and her uncle Frank practiced this vanishing trade. When the 1987 stock market plunge crushed the commodities firm where he had worked, Mr. Del Re was out of a job. After much thought Mr. Del Re bought the grinding truck of Uncle Frank, who taught his nephew-in-law the ins and outs of sharpening steel. Thus, the family tradition was carried on. Mr. Del Re’s fire-engine-red truck. He had to move it to allow traffic to pass. Dominic Del Re at work sharpening one of our knives. Mr. Del Re has four grinding wheels mounted inside his truck; they are powered by an eight-horsepower motor. First he rubs the blade back and forth across the rough grinding stone. After he tests the blade’s sharpness, he buffs it. Then he uses an oilstone to remove bit of metal. He explained why the blades of my knives were chipped. His competitor, a man driving a green truck accompanied by a dog, heats the steel too high, causing it to weaken, resulting in the nicks and dings along the blades’ edges. Mr. Del Re’s fire-engine-red truck. I love this man’s service! It is a vanishing bit of New York City. It is wonderfully low tech ane ungentrified. Best of all, it is unapologetic. Take it or leave it. Sadly, most are leaving it. In a world that encourages buying new stuff, few want to repair what they own. In a city with multiple prepared-food choices, fewer people cook; few have a need for kitchen utensils, including knives. The knives, scissors and garden clippers that Mr. Del Re sharpened for us. Just as I was finishing my turn, a white-haired woman of a certain age came up to the truck door. She asked if Mr. Del Re would be there long; she had a serrated knife that needed attention. She asked how much it would cost; he told her he would have to look at it. She was hesitant. She looked at me, and asked if I was pleased with the work. I told her I was a satisfied customer. That seemed to quiet her concern; but I do not know if she returned with her knife. For our three most-used knives, two scissors and a garden clipper that I brought him, Mr. Del Re charged me $63. He told me I would not need to sharpen the blades for years. Although a good recommendation for his skill as knife grinder, it is does not make for frequent repeat customers, nor for a lucrative business. He said He’s in front of the West Side Zabars every Saturday from 1:00 to 5:00.